The Autonomous region Madrid is located in the centre of Iberia, bordering the regions of Castilla-Le n and Castilla-La Mancha. Its vibrant capital - Madrid city - is, of course, also capital of Spain, with Felipe II moving the government there in 1561. The region can be divided into two areas - in the north and west lies the mountainous Sierra ... in the centre and south is a plateau. Madrid city is Europe s highest capital, resulting in hot summers and cold winters. The mild Spring and Autumn seasons are ideal times to visit this wonderful city. It has so much to offer both culture and entertainment-wise, and is an art-lover s dream. The Museo del Prado ... the Centro de Arte Reina Sof a ... the Museo Thyseen-Bornemisza. The Palacio Real (Royal Palace) with Royal Library and Armory ... the Plaza Mayor with statue of Felipe III ... beautiful churches such as the Catedral de la Almudena ... all attract the sightseer. But this Spanish capital of Arab-fortress origins does not only offer historical monuments. It s a city of wide open spaces, crammed with verdant parks and gardens - the Parque del Buen Retiro ... the Jardines Sabatini. Once you ve "done" the capital, several other gems await you in the region. 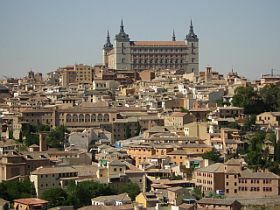 In the foothills of the Guadarrama Mountains lies the gigantic Royal Monastery of St Lawrence of Escorial - Monasterio de San Lorenzo de El Escorial. A few minutes north of El Escorial is the Valle de los Ca dos. Topped with a cross nearly 500 feet high, the basilica holds the tombs of General Franco and Jos Antonio Primo de Rivera - founder of the fascist Spanish Falange. Alcal de Henares is one of Spain s eleven World Heritage Cities. The first city specifically founded as a university - by Cardinal Cisneros in 1499 - it was the birthplace of Miguel de Cervantes and his masterpiece - Don Quijote. Aranuez - on the banks of the River Tagus - teems with royal palaces and gardens. You can read about the other, wonderfully varied, regions of Spain at the links below. Return from The Autonomous region Madrid to Top Tour of Spain home page.